Data is transmitted by the DSO to the BKV, erroneous balancing data is clarified and corrected and possible corrected balancing group invoices are settled on a contractual basis. The exchange of master data then takes place on this basis. In the context of the transmission of the balancing group time series totals by the DSO, the BKV is obligated to perform an examination using a test report. If there is a positive test report, the DSO is informed that the data is accepted. If there is a negative test status, the DSO is informed of the need for a clearing process or the possibility of transmitting a new version. Data transmitted by the DSO by the 10th working day after the delivery month for balancing group billing and by the end of the 4th month after the delivery month for the corrected balancing group invoice is managed by the BIKO as billing data. 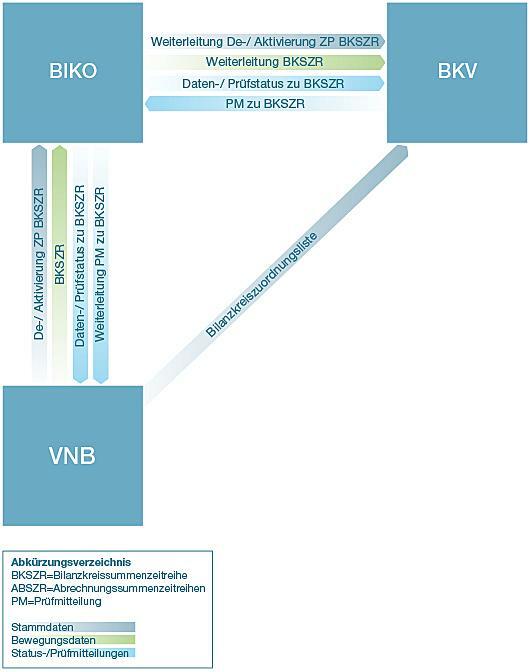 Data transmitted by the DSO after the 10th working day and by the 29th working day for balancing group billing and by the 7th month after the delivery month for corrected balancing group billing can only be accepted as billing data if a positive test report is also promptly sent by the BKV. If balancing errors are not identified until after the corrected balancing group invoice is issued, financial settlement between the DSO and BKV is conducted on the basis of compensation energy prices in the manner described in the applicable allocation agreement. “Master data exchange with DSO and BKV”.